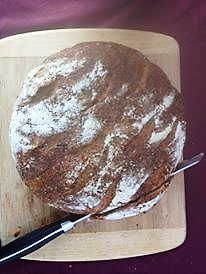 Learn the fundamentals of naturally leavened bread. Practice a fun technique for getting an artisan-quality rise and crust in your gas or electric oven. Leave with a deeper understanding of baking as well as a live sourdough starter, bread flour, and a recipe so you can practice your new skills! Pricing is on a sliding scale from $10 to $30. Space is very limited, so please RSVP as soon as you decide to come!